The Cantareira reservoir water system that supplies half of Sao Paulo’s 20 million residents is now only 10 percent full after more than year of record-setting drought. 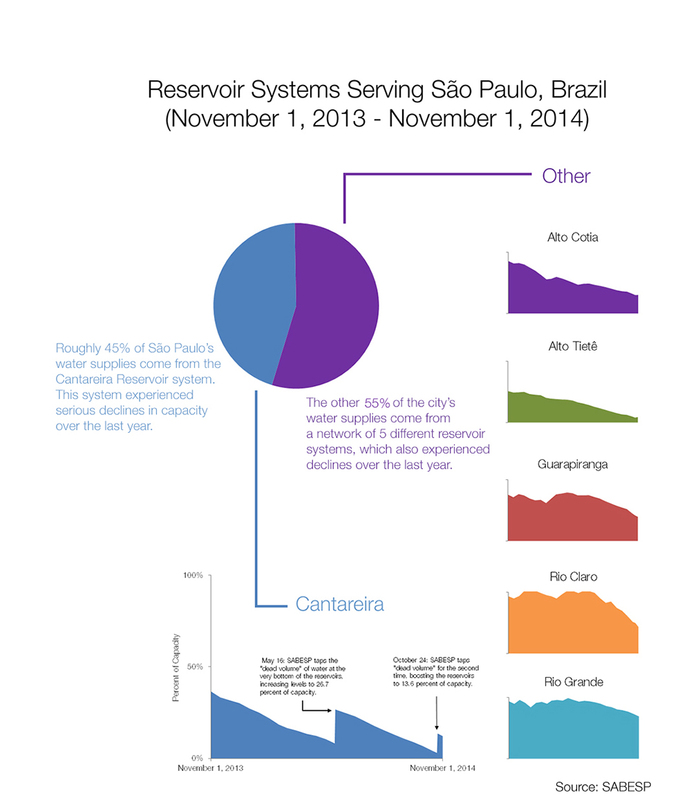 Brazil’s largest city and the ninth largest in the world, Sao Paulo has spent millions of dollars tapping the lowest levels of water in its Cantareira reservoir system this year. Because of this, the city has so far been able to avoid water rationing. In the meantime, SABESP, Sao Paulo’s water utility, has taken a number of measures to preserve water supply and reduce water use. For example, the utility has supplemented the Cantareira reservoir system with water from other systems that have more reserves. The infographic below shows where the city’s supplies come from and how they’ve fared over the last year. Click the infographic to learn more. Water levels in Sao Paulo’s Cantareira reservoir system, which supplies nearly half of the city, reached the lowest mark ever this year. The city’s other five reservoirs are also all down from a year ago. Click image to enlarge.